Lets keep this thread for additional information, clarifying and details on putting together the Linestage. Let's stay on topic and not clutter with questions that can be asked in person. Build the Power Supply module first. 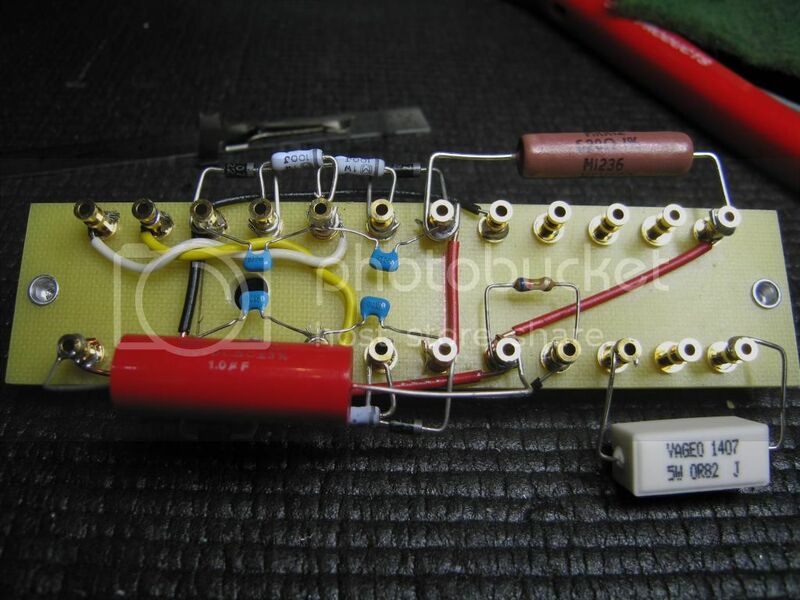 Lay in the wiring between posts, then add in the components. 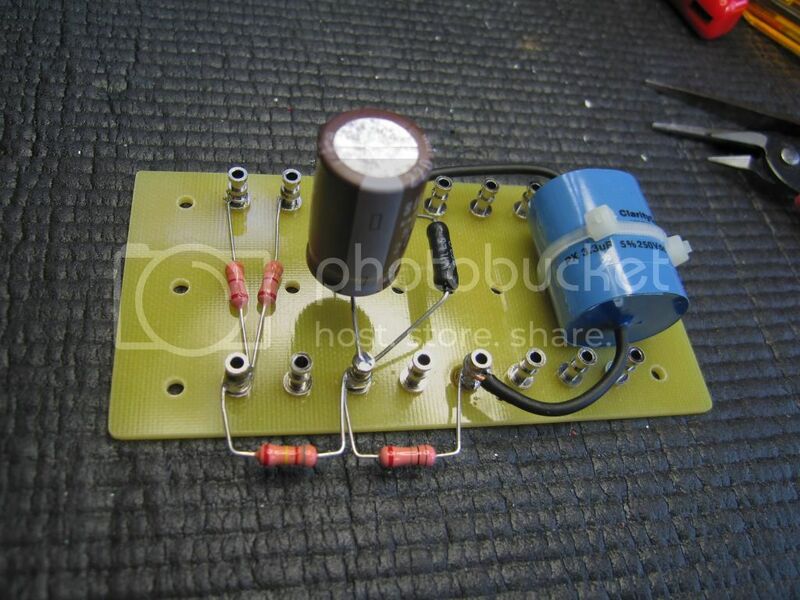 About the bridge rectifier stage. That's diodes, with little resistors and capacitors for transient smoothing. First, remember when bending component leads you want to avoid compromising the component by bending the lead as it leaves the component. Always protect the component by holding small needle nose pliers against the component and bending on the far side of those pliers. Harry can demonstrate, of course, if necessary. Remember, before working with the components, clean those leads! On the diodes, it worked well for me to bend them into a D shape with the span to fit the distance between two posts. Then clip the excess lead length in the center. Then bend the remaining leg length around the posts. On those little caps. Staighten those legs out and leave just enough length to help keep away from the post they span. Don't want them to ever touch that center post. Center the cap body to help with that not touching. Remember that several component leads and or wires may go to each PCB post. Leave room as you go for what goes to each. Last edited by radioeng2 on Mon Sep 15, 2014 3:39 am, edited 2 times in total. After the rectifier stage is the smoothing components. The cap, resistor, cap stage. Watch out for the 620 ohm big body resistor versus the small 620K. The little guy is the safety bleeder on the output. I know that when marking the bags with the part number, I crossed up the big one with the next line item which was the small one. Hang that big resistor off the side of the PCB so it has a litle clearance. It's big because it has to dissapate heat. You want it away just a touch and not too close to capacitors. When you insert the caps down into the posts, leave just enough room to get the iron in there and not touch the caps body. Not too much though, cause the other things inside the chassis get close. We also want to hang the big square white body sandstone resistor (for the filament center point) off the side of the PCB for the same heat dissapation purposes. Last edited by radioeng2 on Mon Sep 15, 2014 3:28 am, edited 1 time in total. Last thing on the power supply module, is we want to hang off it a few wires going away from it into the chassis. If we can solder it on now, it won't be necessary to be reaching into the smaller spaces of the chassis after mounting it and trying to solder it in then. We want to tag out the B+ output and ground wire to go to each channel. We use the small wire twisted together red and black for this. This is real quality wire, but tough to strip the jacket. The technique I use is to use your side cutters and "gum" around the jacket just more than indenting. Trying to give just enough cut into the jacket to give it reason to seperate there when you pull it apart. Then hold the wire right at that point with your left hand while pulling away with the cutters in your right. Not ever pinching so tight you cut the wire instead of stripping off the jacket. This is a tough jacket with beautiful wire underneath. You'll want to cut the twisted red-black to be long enough to go from the left side wall mounting position to the left 8 pin socket with one piece, and the right side 8 pin with a second piece. If I remember right, that twisted wire was about 2.5 feet, so about 11-12 inches for the closer left socket and the remainig for running over to the right. Just a comment. The B+ wiring doesn't normally need twisting. We just did here to help it lay in the chassis as nicely as possible. We also have two seperate ground wires we want to leave the PS going to our grounding common point. I think I need to give a few of you a little more black wire for this. We run a seperate grounding wire for the first stage of the PS down to ground and then a second for the output side so current paths are seperate. We've going to attach a point down on the alumimum cross rail to tag together all the various grounds. So we need a couple 12" or so runs to get to there. Any more additions for the power supply that are necessary from questions may be added further below. Last edited by radioeng2 on Mon Sep 15, 2014 3:44 am, edited 2 times in total. We can attach the wooden sides early on in construction. The fact that the wood side sticks out a little will help protect the paint on the chassis while you're turning it around on the bench. The way you turn the wood to show the side you want is your choice. When you have looked at that and decided which way you want it too face, we want to carefully predrill the wood so the screw going in doesn't split the wood or the hole pre-drilling doesn't go all the way through either. Bring the main chassis and wood by and we can drill out those little holes for you. Otherwise, it's also a good idea to pay attention to protecting the chassis in the construction phase, by working on a soft surface and paying attention to not grinding it into tools while working on it. You want it too look nice as possible when done. You will notice on the PCB when you start, two things. One...is the hole through the middle. This needs to be paid attention to which end it goes as om the top drawing. Two...the small black and red wires crossing directly across the board, I have drawn lines on in those colors to help you get started and orient the board the right direction. Pay attention to the wire colors. All the little wires are provided for you in a little bag. Lay them out by color and size and you should have all the colors and lengths needed on the board. 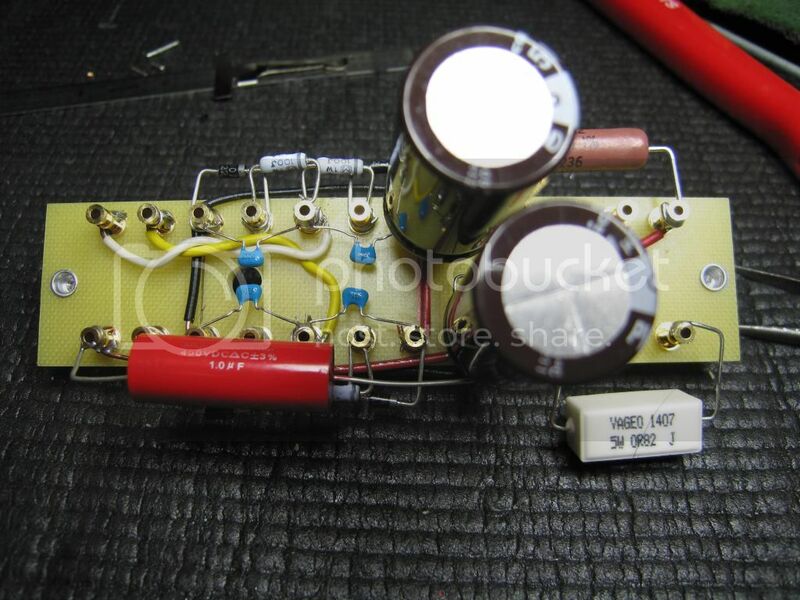 The wires coming from the transformer, the filament center tap wires and the HV AC from the transformer get added later when both the transformer is mounted on the chassis and this Power Supply module is attached. So don't worry about those yet. Transformer wire colors are noted on the main overall schematic in your paperwork. Also note in the drawings the numbers off to the side. These numbers, 1 thru 24 help tell you the post number. Count left to right across the top and then back again across the bottom. You make this seem so organized even I think I could do this. But your notes make it seem possible. Well, a distressing issue was discovered last night when it was found that the dual 9 pin decorative plate ordered had turned into a 9 pin with a 7 pin socket hole dual instead. They are so similar that you can look at it and not realize at first that the hole for the 7 pin is smaller. So a replacement batch is on it's way. The quoted delivery time from Hong Kong with expedited delivery puts them getting here "about" the end of the week. We will just have to play it by ear as to when they get here and if we can get them on before some have already had to leave. Got this all moving overnight as their time is about opposite ours. The tube sockets can be mounted in the top plate without the metal ring. It's likely it can be added in later if necessary without any resoldering.....I think. It will mean some screws being removed that go down through everything, but I think it'll be possible without any desoldering. There hasn't been time yet to investigate this. So while this is certainly an unexpected, painful discover this late, it is what it is and we just move to get it corrected and to get the looks as intended. So the build goes on and it's expected to begin to hear the first built here today. If you want prettier, then you can probably check Mike's or later Martin's. The idea is to keep the big resistors in particular away from the board and especially the caps. So the next step is probably to put together the Linestage PCB's. Few components, easier as long as the posts take solder ok.
Again, a bigger resistor there, we want it out from under the cap for heat and longevity purposes. So don't forget....the pair of these PCB's need to be mirror image! The 9 pin tube socket little jumper wires will come up to these boards. The audio goes in and out on the bottom side along with a few other connections. The PCB's mount between the long 4-40 screws that come down through the tube socket. One end of the board goes on the octal and the other end attaches at the 9 pin. We screw a nut down on those long screws with a washer, drop the board down and then bring a nut down on top leaving clearance to see the tube sockets and be able to do any future necessary work. One of the goals in particular is to have short leads on the grid over to the pair of 3.3K resistors. And to keep the grid leads away from filament wires too. So orderly and clean as possible on the leads is a good thing. The drawing in the paperwork is a good guide for those wires coming over to these PCB's. I have added to the kits another small bag with some 4-40 hardware. 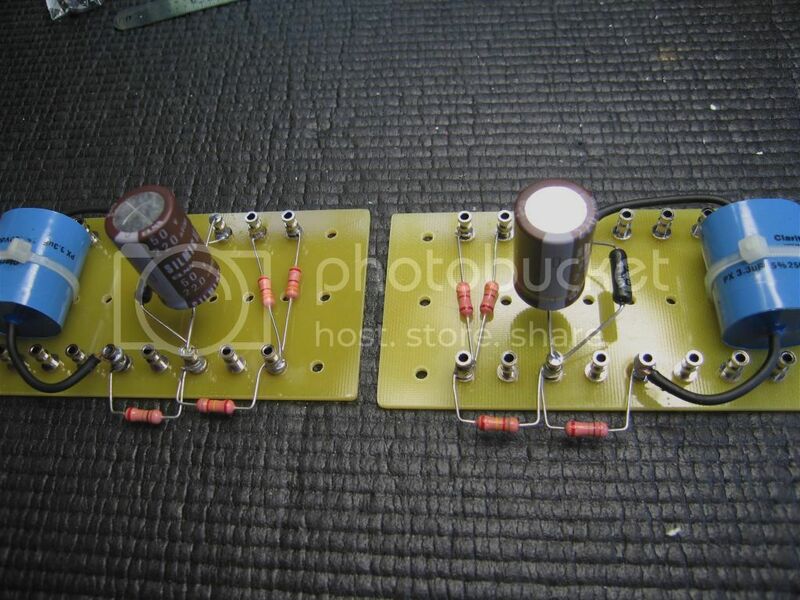 This is necessary to mount the Linestage PCB's on the long 4-40 screws which are the tube socket mount screws. This bag isn't shown on the parts list and is un-numbered. It consists of 8 4-40 nuts, 8 flat washers and 4 lock washers. The use is to drop a nut down the long screw shaft to the level the PCB board should be. Drop a flat on and then the lock washer. Then the PCB board slids down the screw through the end holes. After you check the height to be good (wire length from the 9 pin sockets, the clearance to be able to do any future work on the socket pins) then drop a flat washer on top and then the final nut to tighten down. After tightening, the PCB is pretty stable. After this is in place, you can solder the 9 pin wires in place. Do the wiring and two components at the octal socket for the 0D3 and be ready for the audio wires to come and go. The audio wire in the kit is Mogami. It's a real nice 2 wire with shield. It is a soft jacket and needs care to cut without also cutting the strands of the shield or more. We can use the 3 conductors in more than one way. In the case of the Linestage, I'd suggest wiring the input jacks with the Red as Right, White as Left and the shield as the audio ground. That's from the rear input jacks, to the selector switch. Same then from the selector to the volume attenuator. The input switch has a key feature of switching not just the audio, but also the audio wire ground. This allows the Linestage to not internally have connection to all your input components at all times. Only the device you are listening to has it's ground "shared" with the Linestage. To implement this feature, we need only to use care that the rear input jacks have the shouldered washer keeping the body away from the chassis. And that at the switch itself, we keep the shield wire away from each other. So twist the shield, slip jacket or heatshrink back over it and keep the otherwise bare shield wires from each of the four inputs from touching each other. A little care here has some nice benefit! Then the last step on audio wiring is to route the Linestage output out to the rear output jacks. The same technique of shielding can be used on them. Independent wire for left and right. So the way shielding works, the shield should be used at the lower impedance end and left open at the other. That way, any noise is drained to the ground at the end less likely to "receive" or pick it up via crosstalk. So at the output end of the wire, the shield is grounded. And at the end it's an input, the shield is cut off and not used. Sorry for the photo's not being better. It's the only way to quickly post the info at the moment.